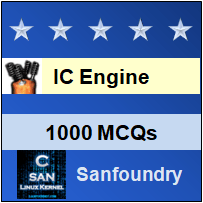 This set of IC Engines Multiple Choice Questions & Answers (MCQs) focuses on “Air Standard Cycles”. Explanation: Generally, the specific fuel consumption per B.P. hour for a petrol engine is about 0.25 kg while the specific fuel consumption per B.P. hour for a diesel engine is about 0.2 kg. Explanation: Generally, the specific fuel consumption per B.P. hour for a diesel engine is about 0.2 kg while the specific fuel consumption per B.P. hour for a petrol engine is about 0.25 kg. Explanation: The compression ratio in I.C. engine is directly proportional to the thermal efficiency, so as it increases, then its thermal efficiency will increase. Explanation: The thermal efficiency of petrol and gas engines is about 30% and the thermal efficiency of diesel engines is about 70%. Explanation: The thermal efficiency of diesel engines is about 70% while the thermal efficiency of petrol and gas engines is about 30%. 9) The working medium of a air standard cycle has constant ___________ throughout the cycle.